Paris, France - FACE A FACE is exquisite and artistic, exploring audacity and the avantgarde. It is a mastery of colours, volumes and expressions, creating eyewear as artwork. 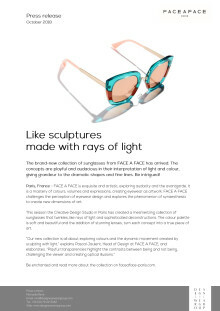 FACE A FACE challenges the perception of eyewear design and explores the phenomenon of synaesthesia to create new dimensions of art. This season the Creative Design Studio in Paris has created a mesmerizing collection of sunglasses that twinkles, like rays of light and sophisticated deconstructions. The colour palette is soft and beautiful and the addition of stunning lenses, turn each concept into a true piece of art. Elegant, sophisticated and provocative; just like the great Gatsby. The graphical lines and elegant shapes are a tribute to the 1920’s Art Deco aesthetic and colour palette. The deconstruction of the lines, creates an opening and lights up the front. MEYER echoes the aesthetic of the steel frame windows from the first Bauhaus manifesto by architects Meyer and Gropius. The strong outlines are formed by pressing two layers of acetate together creating a unique expression. SPARK plays with a golden bridge and golden temples in this extravagant sun concept. The transparent line deconstructs the front like a beam of light, creating a new geometry of the frame. This is inspired by the ‘Anarchitecture’ of Gordon Matta-Clark. Be enchanted and read more about the collection on www.faceaface-paris.com.